January has been an emotional roller coaster for me. Lots of changes in my household, as my partner has a new job with a big commute, and lots of ups and downs in my art practice. I'm in the sloggy middle with my current George Washington print, a time when I tend to lose heart, and I've also accumulated more rejection letters this month than any other month I can remember. The trouble with rejection letters is that they just appear whenever they appear. You don't have time to get prepared and steel yourself, so if you happen to be having a low-energy day a rejection letter/email can throw you into a rapid downward spiral. I recently encountered an artist on Twitter named Diedra Krieger who created an art piece about rejection letters called "Building Backbones." In this performance work, artists were invited to submit rejection letters from grant or residency applications, or exhibition submissions. The letters were then projected and attendees read them aloud in unison. I watched a video of the event on Krieger's site and found that the unison reading gave the letters both gravity and a tinge of absurdity. For me it also mingled with a liturgical feeling that probably comes from my many years as a youth attending mainstream Protestant churches. Chanting rejection letters with others seems as good a way as any of transforming the pain of rejection into a source of power for building backbone. Another way I've found to keep my spirits up is to hear from other artists how they keep on task. 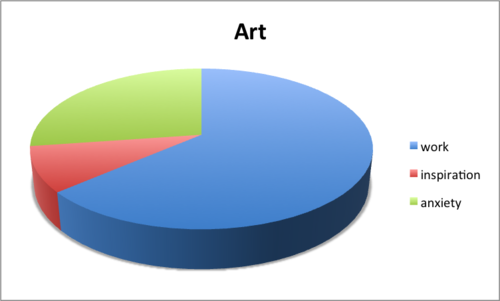 I've just started reading a book called The War of Art: Winning the Inner Creative Battle by Steven Pressfield. Pressfield offers a strong, no nonsense, just-do-it approach to overcoming resistance in any art practice. A softer and more expansive book about work in general, not just art, is poet David Whyte's book Crossing the Unknown Sea: Work as a Pilgrimage of Identity. A friend of mine reminded me of it today, so I plan to re-read it after I finish the Pressfield book. What I'm feeling today, having digested the latest rejection email, is that acceptances and rejections are not what it's about. Yes, pursuing opportunities for my artwork is part of my job. But that job is to find the opportunities and apply. Once I've sent my application, I've done my job, I've made my effort. Expecting anything in return is a waste of valuable energy, energy that should rightly be spent on making work. Making work is the point, and is my joy. I'm making a plan for a little letting-go ritual to do when I send out the next batch of applications -- something to remind me that once I mail them they aren't mine any more. This morning I came across a video of Stephen Colbert interviewing Terry Gross of NPR's Fresh Air and I got another lift of inspiration from that. In the beginning of the interview, Terry Gross admits that her first job was teaching English and that she was in fact fired from that job after 6 months. Colbert says what we're all thinking: "Why did they fire Terry Gross??" "Because Terry Gross was a terrible teacher," she replies. I love that. Terry Gross got fired from her first job. She must have felt very bad at the time. But wow, look what happened. Here's the video -- enjoy! 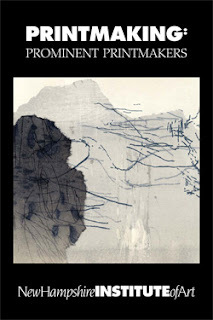 This past Wednesday I delivered four pieces of art for my first group show of 2012, the Prominent Printmakers exhibition at New Hampshire Institute of Art in Manchester, N.H. The show will include the work of 13 artists, many from here in the Pioneer Valley of western Massachusetts. For me, this show will be the first time I show work from my new money-related series "Loaded". Local New England folks, I hope you can make it! We in America like to think of ourselves as visually literate. We like to think that we're wise to the ubiquity of advertising in our environment, that we can spot a doctored photograph in a magazine, that we can "read" and interpret the hundreds (or thousands) of images that we see every day. I've spent the past 25 years as an artist, making images for commercial clients, and I'm not so sure we're as literate as we think we are. For starters, we spend only a few seconds viewing most of the images we see in the course of a day. (We commercial artists have a joke that the thing we're working on, whatever it is, will be lining the bottom of someone's bird cage in a day or two.) You can't "read" an image in a few seconds any more than you can read a page of text in a few seconds. To read and interpret an image, one needs to observe the composition, the colors, the focal points, the lighting. One needs to consider context, historical setting, the medium used to make the image, and style. And then it's important to examine one's own emotional and intellectual response to help make the meaning. All of this takes time and attention and intention. I've been conducting a small experiment among my friends and family, asking them to draw the back of a dollar bill from memory. None of my respondents, myself included, could do it. Yet this is a visual object that passes through our hands almost every day. One thing everyone knows, though, is that George Washington is on the front of the bill. So even though I had intended to only use imagery from the back of the $1 bill, I've decided to give George some love. I've been slowly carving a giant 24" x 36" blow-up of his face. Its feeling kind of intimate, being so up close to this very well-known image of Washington, which is an engraving based on a painting made in 1796 by Gilbert Stuart. George Washington had curly hair. George Washington had blue eyes.